We’re all moved in to our new place! JCWC is now housed at the second floor of Keiter Hall of All Saints Episcopal Church in the Woodstock neighborhood. 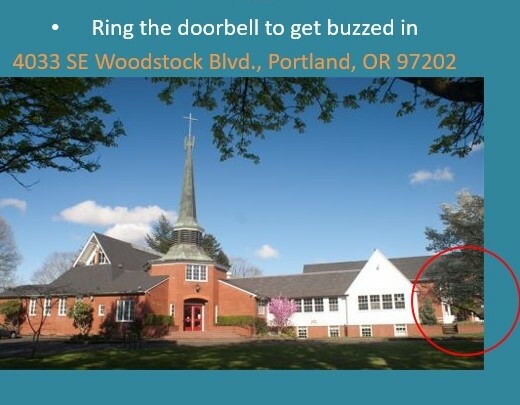 The door to find us is not the main entrance (with red doors) in the parking lot – please use the door near the Meditation Garden that’s closer to Woodstock and SE 41st. Look at the maps below to locate the door to Keiter Hall. Due to a downstairs preschool, this space has tighter security and is always locked. Ring our doorbell – then we’ll come down the hall and downstairs to open it up for you! The address is 4033 SE Woodstock Ave, Portland, OR, 97202. Check out the images below to pinpoint our location! If you are planning to swing by, we appreciate a heads-up! Save the date for our office warming party on Friday, September 21!